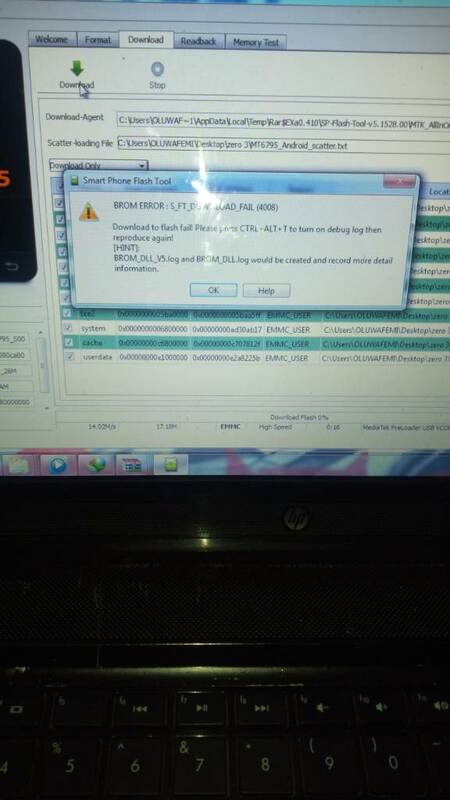 Hello team hovatek, my infinix zero 3 x552 does not switch on again. I've tried to used flash tool to download the another rom on it. But anytime I connect the usb to the computer I hear a sound that's it's connected then later on another sound will come up,that's it's disconnected I've tried everything. Download new drivers. Download new sp flash tool but the flashing process is always interrupted by the usb disconnection. I've tried another laptop and usb cable. But the flashing could not be done. As at now the phone does not even come up. Even after charging it for long. Before it stops coming up, it usually switch on by itself show infinix logo and then restart by itself then later on switch on again and off till infinity. Then after I tried flashing it, after awhile it doesn't even turn on again. And it just keeps bringing different error from flash tool. But I think the main problem is from the automatic frequent disconnection from the laptop. I've attached the errors I encountered with this email. Please help me out. God will continue to bless your organization. (09-18-2017, 04:33 PM)femlas25 Wrote: Hello team hovatek, my infinix zero 3 x552 does not switch on again. 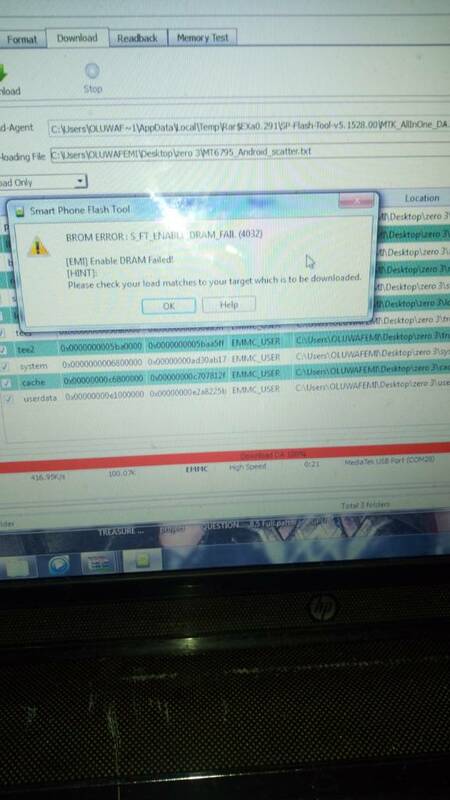 I've tried to used flash tool to download the another rom on it. But anytime I connect the usb to the computer I hear a sound that's it's connected then later on another sound will come up,that's it's disconnected I've tried everything. Download new drivers. Download new sp flash tool but the flashing process is always interrupted by the usb disconnection. I've tried another laptop and usb cable. But the flashing could not be done. As at now the phone does not even come up. Even after charging it for long. Before it stops coming up, it usually switch on by itself show infinix logo and then restart by itself then later on switch on again and off till infinity. Then after I tried flashing it, after awhile it doesn't even turn on again. And it just keeps bringing different error from flash tool. But I think the main problem is from the automatic frequent disconnection from the laptop. I've attached the errors I encountered with this email. Please help me out. God will continue to bless your organization. That's error 4008 and error 4032 . 4008 points at a problem reading or writing to your phone while 4032 points at a mismatch. Thanks so much team Hovatek for this tutorial . I'll try everything you've said. I just want to ask in case I tried everything you advised, and I'm still encountering error. How am I supposed to fix emmc chip? I will be glad if you can give me an idea. Thanks. I really appreciate. (09-19-2017, 03:00 PM)femlas25 Wrote: Thanks so much team Hovatek for this tutorial . I'll try everything you've said. I just want to ask in case I tried everything you advised, and I'm still encountering error. How am I supposed to fix emmc chip? I will be glad if you can give me an idea. Thanks. I really appreciate. Hello team Hovatek. I'm really thankful for your help so far. I tried everything you told me to do from the tutorial. When I plug in the device. It's listed as mediatek usb port in device manager. Whenever the connect and disconnection sound pop out. 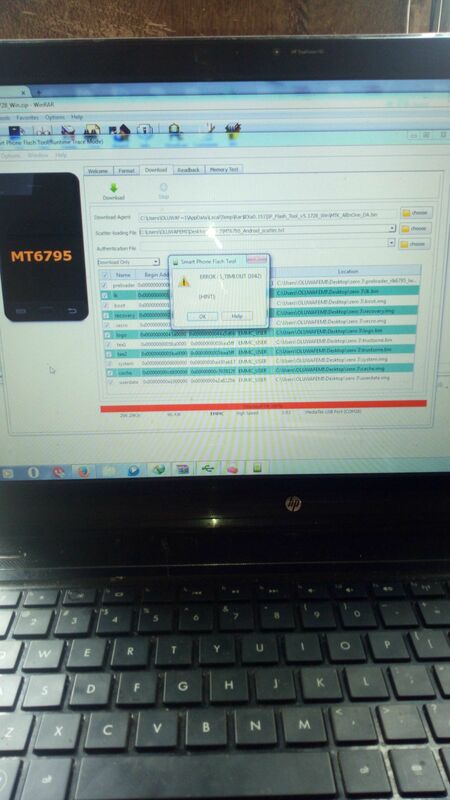 The mediatek usb port keep disappearing and appearing I've also tried to update the driver manually from the device manager like you said... But the phone still keeps disconnecting and making the connecting sound repeatedly. When I tried on flash tool, it's giving me timeout error. Have also given the phone to an engineer to help check for hardware issues. Buh nothing is wrong with the hardware. So what I'm thinking is that could it be that the charging port of the phone is the cause if all this connecting and disconnecting problem. What about if I I have the charging port changed? Will it solve the connecting and disconnecting issues? I will be expecting your reply. Thanks so much in advance. I will post the screenshot of the error. Since device manager is refreshing/detecting your phone. I don't think you need to replace the charging port. You were asked to replace emmc chip, have you done that? I think the problem is a connection issue. I was told to replace the emmc chip, if the flashing is not successful. But I can't even connect let alone flashing the phone. From the screen shot I posted it's a connection issue. That's why I'm guessing maybe the phone Port has problem establishing data connection. Because it disconnect like after three seconds of connecting. So I'm guessing it's the Port. And also I believe changing the emmc chip will be costly, and I don't have much . so what can I do to establish a stable connection I've tried different ports , USB cable and laptop. Can it be the phone Port? Also where can I get a good engineer that can fix emmc chip? (09-20-2017, 04:58 PM)femlas25 Wrote: I think the problem is a connection issue. I was told to replace the emmc chip, if the flashing is not successful. But I can't even connect let alone flashing the phone. From the screen shot I posted it's a connection issue. That's why I'm guessing maybe the phone Port has problem establishing data connection. Because it disconnect like after three seconds of connecting. So I'm guessing it's the Port. And also I believe changing the emmc chip will be costly, and I don't have much . so what can I do to establish a stable connection I've tried different ports , USB cable and laptop. Can it be the phone Port? Also where can I get a good engineer that can fix emmc chip?